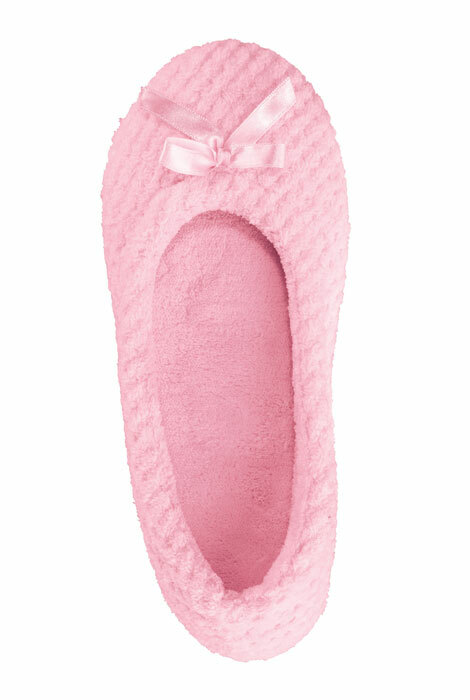 Pampering your feet in velvety soft chenille, these luxurious ballet slippers offer cozy warmth, luxurious cushioning and the feminine style you love. Skid-resistant rubber soles offer traction and durability, making them great for any surface. Choose from 3 pretty colors—each with matching satin bow for an elegant touch. Polyester; spot clean. I've owned several pairs over the years. 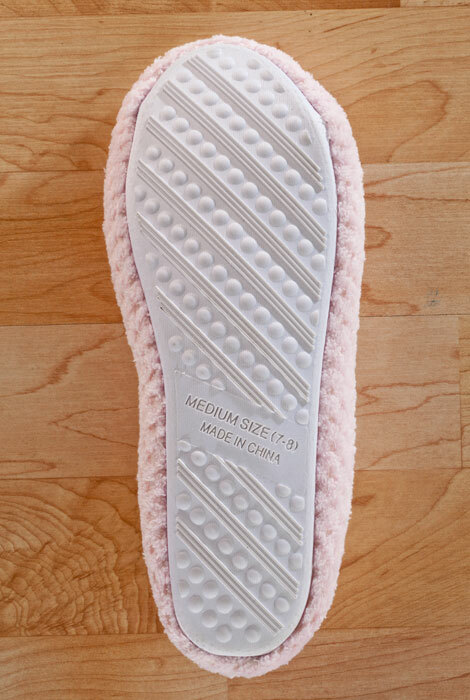 Great comfortable slipper. No sweaty feet. Doesn't slip off. great wear them all time in house an some outside . I forget I am wearing them and go outside to water flowers or such. I love to wear slippers in the house & these are really comfortable. Glad I got them. The Best Slippers You Will Ever Own! I've been buying " Ballet Slippers" for years. They best fit my needs and comfort! true to size and look sturdy. I was hesitant to buy skippers online because I have got some from other websites in the past and not been happy with the quality. These are just great. They are sturdier than I thought. They feel so good on. They are snuggy and warm. Also has nice cushioning in the bottom. I am going to order more for Christmas gifts. These slippers are very comfortable. They don't give much support but are good for around the house. Very cute and the color blue is attractive. At first glance I thought they were too big. They are a little long, but fit well enough to wear. I wear a size 10 shoe so I decided to order a larger size in these slippers (xl 11-12) I am glad I did. These slippers run small. Even with the extra size the are still tight at the toes. I ordered a size bigger than I wear, from reading the other reviews. It didn't do any good, they are so tight across the toes that my toes were going numb after having them on less than 10 minutes. Since it costs more than half the price to send them back, I won't bother. VERY disappointed in these slippers. I had been wanting to order these for quite some time. Just tied them on (I wear a size 11 women's shoe) and the XL which is supposed to fit up to size 12 is way too short for your toe area. Make sure you order up a size if possible. I cannot so am returning. I shouldn't have. They did not fit me, but I waited too long to return them - so, OH WELL! I love small slippers while on the couch! I like closed slippers and thought these were pretty and i need new ones.